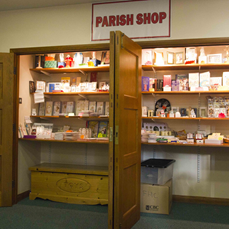 The Parish Shop or Piety Stall is located in the Parish Room at the back of the Church. The shop will be closed during Mass. The card stand is available every time that the Church is open. If you take a card when the shop is closed, please give the money for the card to the shop volunteer on the following Sunday. The shop has a variety of cards, gifts and devotional items. The shop is opened each Sunday by a loyal band of volunteers. We are always looking for new helpers, particularly for Sunday evening Mass. The shop’s main purpose is to provide a service to parishioners or visitors to our Church. The profit made on the sales is paid into Church funds. If you are looking for something specific or a special gift, we can look to order for your from our suppliers if it is stocked. Plenty of notice is advisable. Please speak to Gemma Pendlebury who is happy to help.